Today’s guest was Ramesh Venkatakrishnan, a geologist from our town working for his own company in Mount Laurel with GeoSTEM. First, he told us about himself and his experience as a person who came to the U.S. to fulfill his hopes and dreams. This was inspiring, as the students were encouraged to pursue their dreams, and to work for what they want. He also told us about geology and orienteering, showing the group how to use a compass. The students were allowed to take out their phones and discover how to find directional north, east, south, and west. After the fun compass demonstration, he put the students into teams for the activity and showed them how orienteering works on a map, as well as the activity setup. Before going outside for the activity, he gave everyone a basic lesson in mapmaking and scaling of maps. After the outdoor activity, everyone came inside and had the opportunity to see some of his geology finds from the six continents he has visited as a part of his job. We used our smart phones to discover how to find directional north, east, south, and west, and after the compass demonstration, he divided us into teams for the activity. 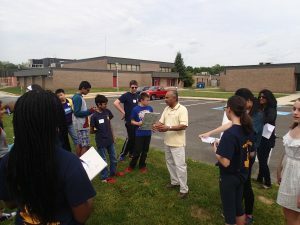 Dr. Venkatakrishnan showed us how orienteering works on a map, as well as the activity setup. Before heading outside for the activity, he gave everyone a basic lesson in mapmaking and scaling. Outside he had set up 12 flags, as well as a ravine, and each team had to navigate from place to place trying to correctly determine the entire distance of the course. Even though not everyone was totally accurate, we all had a very good time trying to figure it out! After the orienteering activity, Dr. Ramesh Venkatakrishnan shared his geology finds from the six continents he had visited throughout his career as a geologist. 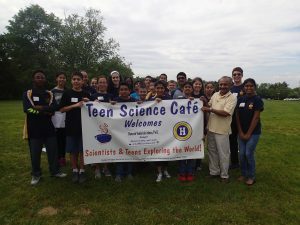 Sanjana Jampana is a Teen Leader with HMS Teen Science Café.